The color correction module has been developed as a method of normalizing image-based data sets for more accurate image analysis. PlantCV is composed of modular functions that can be arranged (or rearranged) and adjusted quickly and easily. Pipelines do not need to be linear (and often are not). Please see the pipeline examples below for more details. A global variable "debug" allows the user to print out the resulting image. The debug has three modes: either None, 'plot', or 'print', If the global object, plantcv.params.debug is set to 'print' then the function prints the image to a file. If using a Jupyter notebook, you would set debug to 'plot' to have the images plot to the screen. Debug mode allows users to visualize and optimize steps on individual test images and small test sets before pipelines are deployed over whole datasets. For simple input and output, a helper function plantcv.transform.correct_color was developed. Check out our interactive NIR tutorial! Important Note: This function has been developed with only 8 bit images in mind. Images of other bit depth are not compatible with this function. Target and source images must contain a reference from which color values are sampled. The following example uses a 24-color Colorchecker passport. A target image (RGB) must be chosen. This image will be of the color profile to which other images will be corrected. A source image (RGB), that will be corrected to the target image's color profile. A mask (gray-scale) of the target image in which background has value 0, and color chips from the colorchecker are labeled with unique values greater than zero, but less than 255. A mask (gray-scale) of the source image labeled consistently with the target image's mask. We have an example of how to create a gray-scale mask of color chips. The modularity of PlantCV allows for flexible development of pipelines to fit the context and needs of users. The development of a pipeline for color correction is no different. Below are two potential scenarios with possible color correction pipelines. For situations where only one source profile is identified per target profile, or one source profile will serve as a representation for many images, a simple pipeline can be developed to produce a transformation matrix that can be applied to the set of images congruent to the source profile. 1) Read in target, source, and mask images. #Since target_img and source_img have the same zoom and colorchecker position, the same mask can be used for both. 2) Declare an output directory to which your target, source, and transformation matrices will be saved. 3) Run the images through the plantcv.transform.correct_color function. 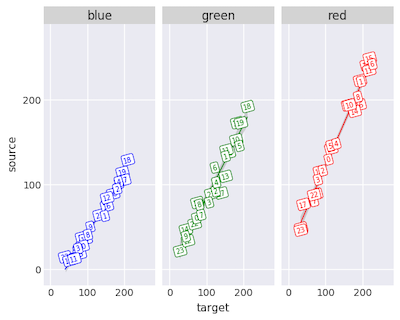 If you are in debug mode "plot", a horizontally stacked comparison of the source, corrected, and target images will be displayed. 4) Using either the returned transformation_matrix or loading the transformation_matrix from its directory, you may now apply the matrix to congruent images. Important Note: The color correction submodule has been made with the capability to handle incomplete colorchecker data in the source image. This way if color chips have been cut off, the module will still work. Color chips do need to be consistently labeled from target to source. For situations where each source image contains a colorchecker, a pipeline may be optimized by using functions from the transform submodule. The target_matrix may be saved separately and referred to as needed for each source. 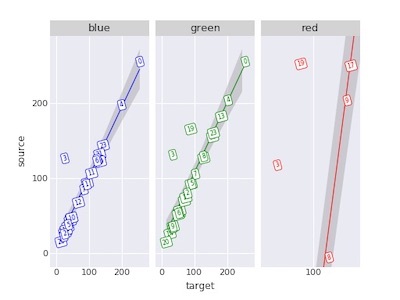 2) Save the target color matrix. 3) Compute the source color matrix. 4) Get the Moore-Penrose Inverse Matrix. 5) Calculate the transformation matrix. # deviance is the measure of how greatly the source image deviates from the target image's color space. # Two images of the same color space should have a deviance of ~0. 6) Apply the transformation matrix. We have added functions to semi-automate the tasks of detecting and creating a color card mask. This program illustrates how to create a gray-scale mask for use with plantcv.transform.correct_color. 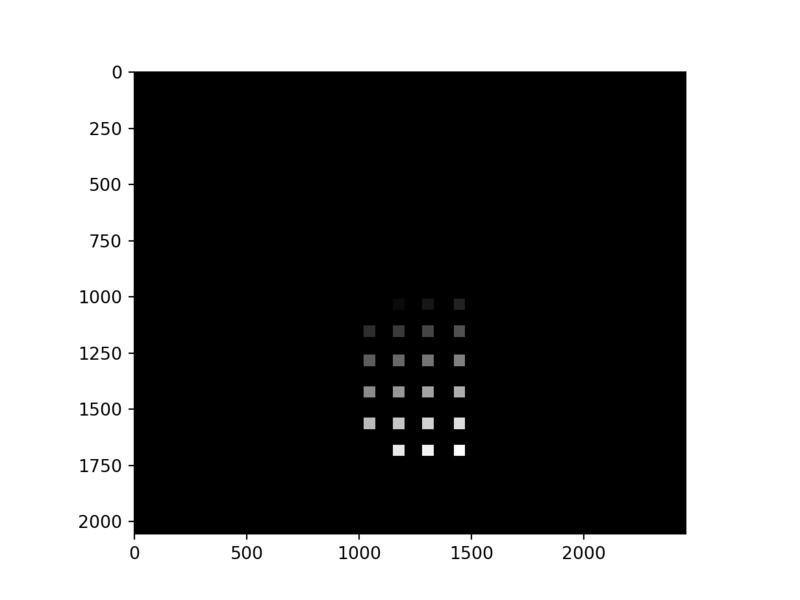 #Using the pixel coordinate on the plotted image, designate a region of interest for an n x n pixel region in each color chip. mask = np.zeros(shape=np.shape(img)[:2], dtype = np.uint8()) # create empty mask img. # draw contours for each region of interest and give them unique color values. mask = mask*10  #multiply values in the mask for greater contrast. Exclude if designating have more than 25 color chips. cv2.imwrite("test_mask.png", mask) #write to file. 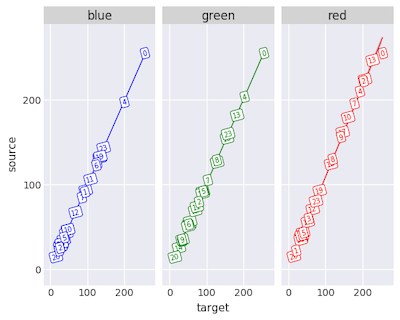 The relationship between RGB values in the source image and the target image should be extremely linearly related. Plots are labeled with the chip numbers in order to help determine problematic. Black and white chips can often be fully saturated which can affect color transformation outcomes. Plots that don't exhibit a strong linear relationship indicate problems with one or more chips in the color card. Over/under saturation of color channels can effect color correction. Sometimes problematic chips can be excluded when creating a mask. Using %matplotlib notebook in a Jupyter notebook can be used to examine which color card chips might be problematic. The zoom to rectangle tool will allow for closer examination. In the example above there are only two chips that seem to deviate from the linear pattern expected. In this case we can go back and try to exclude chips 19 and 3 in the mask before running the pipeline again. 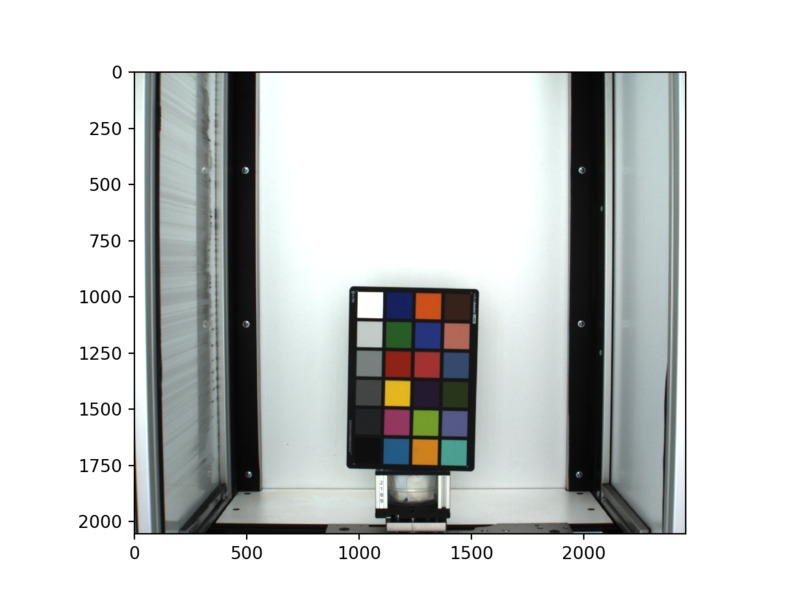 However, in the second example there is differences in the range of values among color channels indicating that camera settings and/or lighting technique likely needs revision in order to successfully use color correction.